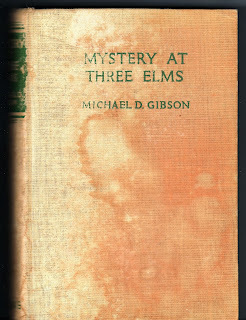 Written by Michael D. Gibson Mystery at Three Elms is actually a boys’ adventure story I found in my father's collection of books but this 60 year old lady enjoyed it immensely. Published in 1948 (even before I was born!) it is set post World War II. The story begins at the end of WWII. Captain James Bell’s old friend Major “Billy” Bristow will soon be returning from the Far East after serving nearly six years in the Army. In a letter he asks Bell what condition his place, Three Elms, is in. Bell has time on his hands since the Air Ministry has dispensed with his services indefinitely and decides to do his old friend a favour and drive to the Cotswolds, Gloucestershire to check out the place and get it ready for his friends return. 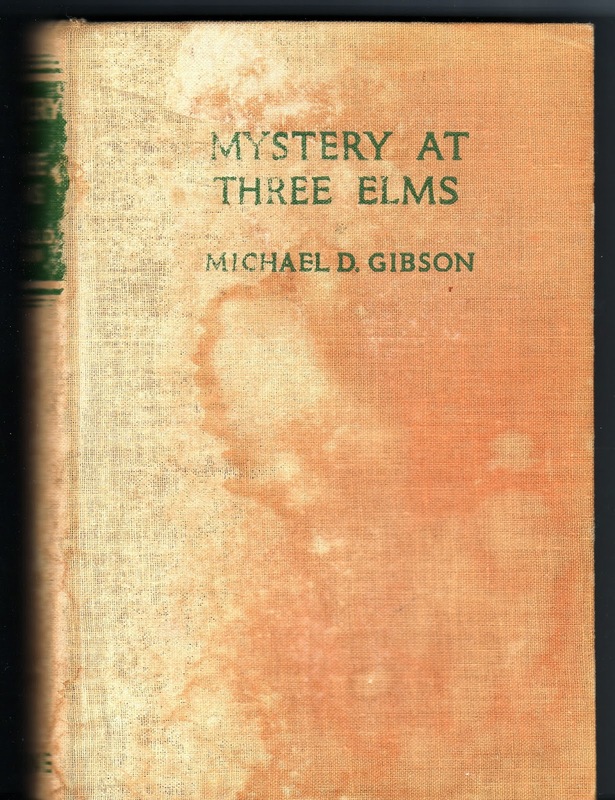 After arriving in Godsell and booking into the local pub he walks to Three Elms to have a brief look around. Although it is jut on dusk he is surprised to see what appear to be bulky objects in one of the rooms. He is surprised at his discovery because his friend’s furniture and belongings are in storage. He decides to investigate further the next morning in daylight. Adding to the mystery are strange tyre tracks in the driveway. When he returns to the house the next morning he realises he had nt been mistaken the previous night. There stacked in the room, under dust sheets, were paintings and furniture and they certainly were not his friend Bristow’s style and taste. Rather than break in he decides to visit Bristow’s agents, Harding and Thripp, in nearby Cheltenham to collect the keys to the house. As he returns to the town he meets Henry Brusch. We discover later that Brusch, a German, has been in an internment camp during the war. Bell hears from the locals how the personality of this once friendly man has changed during the war. In Cheltenham he tells Thripp about the mysterious collection in the house. Thripp, stunned and the revelation insists on accompanying Bell back to the house. When they arrive the furniture and painting have disappeared. Mr Thripp is not at all impressed and accuses Bell as being either a liar or a half-wit. Regardless of Thripp’s opinion of him Bell is determined to find out what is going on and asks his friend, Red O’Bannion to assist with the investigation. Red is a fiery Irishman who fought under Bell in the war. He’s already ready for adventure and even more ready for a fight. Bell wants to examine the house more but before they do that they decide to call on Brusch. As they arrive at Brusch’s farm they notice a car disappear and a man watching the property. Who is this man and why are they watching Brusch’s farm? As the story unfolds they discover there are a group of men involved in spying on Brusch. Who are they? Why Brusch? Before answers unfold, including the reason why Brusch has changed, Bell and O’Bannion get in a fight with the men, are kidnapped and threatened with death. It is pure escapism and fun reading. CJ Dennis is my favourite Australian poet. In his books such as The Sentimental Bloke, Ginger Mick and Digger Smith he depicts the ordinary working men and women of the time. These books are written in dialect verse which can take a little to get used to but once the reading is mastered it adds more to the depicting the characters than if it had been written in plain English. For those who have difficulty in understanding the Australian slang of the day he uses there is a glossary at the back of the book. 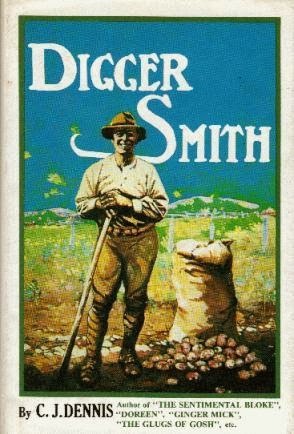 Digger Smith is the sequel to Ginger Mick who was lost at Gallipoli. Unlike Mick, Smith returns from World War 1 but has lost a leg in the war and considers himself “’arf a man”. The story is told by the Bloke (Dennis’ character from “The Sentimental Bloke”) and through his eyes and those of his wife Doreen we understand the difficulty Smith experiences. There is clear depiction of the attitudes of the working class of the time to WWI. However, it is not just about the war, it is about mothers and sweethearts left behind and the struggle they also endured. It is about the after effects on the men of the men who fought. There is tenderness expressed by The Bloke, Doreen and the other characters in the way they care for their neighbours and .supporting them through hard times. It shows the compassion and wisdom of the common people in a humorous way that you will want to read over and over again. An’ we’ve ‘ad time to think a bit between the fighting stunts. That used to get us rattled once, seems very small to us. ‘On its ‘ind legs,’ she sez, ‘it used to stand. 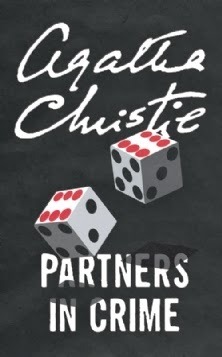 The ‘partners in crime’ are married couple Tommy and Tuppence Beresford. Just as Tuppence is bemoaning that she is bored and will have to buy some more hats they are visited buy Agent Carter seeking their help. 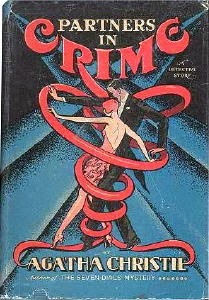 Christie brings them back in 1929 in this series of short stories. While each story does have its own mystery and investigation there is one story line throughout. At Carter’s request they take over Blunt’s Detective Agency, known to be a link with a Russian spy ring and are once again embroiled in mystery. While their main goal is to expose the Russian spies they must take on bone fide cases. The cases range from breaking an alibi (the result of a casual wager) to murder with a tantalising sprinkling of dangerous contact with the Russian syndicate. While essentially classified as a short story collection some stories span two chapters with the mysterious Russian mystery popping up from time to time until the last story. Tommy and Tuppence are both keen detective fiction readers and to add some fun to their cases they approach each case in the manner of a different fictional detective including Sherlock Holmes and Father Brown. When an early reference to using their “little grey cells” appears I thought that was Christie’s token mention of her own famous fictional detective but investigating a case ‘Poirot style’ is the comic feature in the last story. These stories are not deep mysteries. Tommy and Tuppence’s love life and often take a light hearted view of even some of the more serious situations they find themselves in. Set in the late 1920s their escapades are zany and whacky so typical of that time. It entertaining and relaxing reading. Added to the main characters is the unconventional Albert, employed by them at home and changes his ‘performance’ according to his latest favourite movie character, is now receptionist at the detective agency providing even more opportunities for his role playing and more fun for the reader.